Jays' Tee Vee: Pokemon Go Be Racis'! I've NO idea what the first one is. The electric rat, I know. Yeah, you've seen 'em ... Walking around ... Faces in their cel phones. Never did care for the show and certainly not for the games. There's better anime out there, though I will admit Pokemon was a great "gateway" anime that led prospective fans on to better shows. Now we have this cel phone/Google Maps game everyone and his mother is playing. In Bosnia, players are warned not to wander into mine fields. A group of players were confronted by a very irate veteran at a war memorial for their flippancy and irreverence. One player was shot in Columbus, Ohio when he pursued someone stealing his phone. C'mon people ... Pikachu ain't worth it! I understand the pokestops and "gyms" for the game are mostly at public places and hopefully not private residences. That's all I need ... Some idiot knocking on my door at 3 AM wanting to get in because there's a pidgey in my apartment. HEY! ... Any pokemon in my place are mine! You can't have them! That goes double for Jessie/Musashi. Yeah, I know. She's not a pokemon but if she's at my place she definitely stays. You're free to have gay boy James and Meowth though. 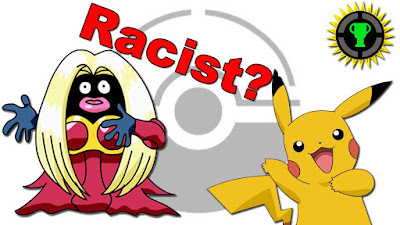 Now we find Pokemon-Go may be ... get this ... RACIST! Seems to be a dearth of pokestops and gyms in minority neighborhoods. Gee ... Now why could that be? If you MUST go into a "no go" area (And I advise you DON'T.) then do it between 3AM and 11:30 AM. That's when most of the miscreants are "sleeping it off". Any policeman will tell you that's the easiest shift for any cop. get interested in that franchise. Stormfront (White supremacist message board.) thread on the subject here. "The place is infested with diglets!" An old Pokemon article of mine, Pokemon uh Yeah, here. Go to Jays' Tee Vee blog main page here. Any articles (And NO diglets!) under this one means yer already there.